After what seems like too-short of a summer vacation, kids across central PA are preparing to head back to school. Whether walking to school or walking to a bus stop, it’s important for students, parents and motorists passing by to be reminded of pedestrian safety. Always look both ways before crossing a street, even when a bus extends its stop sign. Just because a bus extends its “stop” signal for a student to cross the street and step onto the bus, does not mean that a motorist passing by will stop. Believe it or not, over 1,000 drivers are caught each year disobeying the law regarding stopping and school buses. Despite the $250 fine, addition of five points to their driving record, a two-month suspension of their license and the risk of injuring children, these drivers fail to obey Pennsylvania law. When a school bus has red lights flashing and the stop sign extended, motorists are supposed to stop at least 10 feet away from the bus. This includes all motorists traveling behind, alongside or toward the school bus if there is no physical barrier between lanes, such as a concrete median. This is also true if the school bus has stopped at an intersection; all other vehicles at the intersection must stop until the bus has retracted its stop sign and stopped flashing its red lights. However, because you can’t depend on motorists to stop, students should look both ways before crossing a street to get on the bus. Not only may motorists in the passing lane not stop, motorists in the same lane behind the bus may not get stopped or may try to pass the bus when it stops. Students should always walk in front of the bus and make eye contact with the bus driver to make sure the driver can see them. Arriving at the school bus stop early will reduce the chances that children will chase after the bus due to being late. Running or chasing after the bus puts children at risk of being hit by a passing motorist. Stand away from the curb while waiting for the bus. Children should stand at least 6 feet away from the curb, if possible, while waiting for the bus and until the bus has completely stopped. They should not move toward the bus until the bus driver has extended its stop sign and turned on its flashing red lights. Students should never push or shove others near the road or even while the bus is stopped. They should enter the bus in a single-file line. Use crosswalks and wait for crossing guards, when applicable. When walking to school or the bus stop, students should always use crosswalks and wait for crossing guards, when directed to do so. Crosswalks allow students to be more visible and in some instances, give them the right of way. However, they should always still stop and look both ways before crossing. They should wait until a car comes to a complete stop before entering the roadway. Don’t walk behind cars at intersections. If a car is blocking a crosswalk at an intersection, students should wait until the car moves before entering the roadway. They should NOT walk behind the car and certainly not in front of the car, where they are more likely to be unnoticed and struck. Do not race the pedestrian countdown signals. In most states, it’s actually illegal to start crossing an intersection when the flashing red hand and countdown numbers appear. The countdown is simply there to help people already crossing the street determine how much time they have left to finish crossing. So students should only step off the curb to cross an intersection when the white walking symbol appears (and they should still look both ways in case a motorist is turning into the roadway). 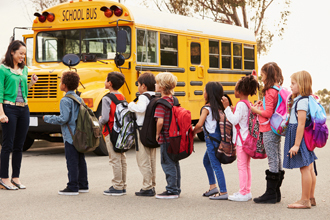 Even with the highest level of precaution, accidents and injuries can occur to children while waiting, entering or leaving the school or school bus. If your child has suffered due to a careless driver, contact the personal injury lawyers at KBG. We offer a free consultation and will fight to get you the Results You Deserve®.